One of the great things about having a partner like RealCyclist.com is we get some sweet deals on the sweetest gear. The even greater thing about partnering with RealCyclist is they want to share the love with everyone from time to time. It requires minimal effort on your part and puts all the pressure on us! Here is the deal. The first thing you need to do is become a fan of RealCyclist.com on FaceBook to do so click this LINK and become a fan. Now here is where we have the pressure on. If any of us from Big Ring land on the podium this weekend at the Boulder round of the NACT, you the lucky reader will be able to get a smoking deal on a Rocky Mountain Solo CXD ‘Cross Bike. 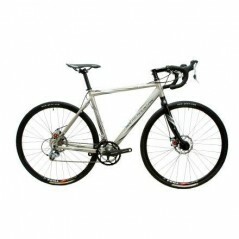 Retail on this bike is $1399.95 and RealCyclist is letting them go for $699.97! Damn, if you always wanted a 2nd bike for cross here is your chance. Quantities are limited and you must be a Facebook fan to be eligible. Oh and we have to get on the podium. See, all the pressure is on us!